The concept of lead nurturing isn’t just limited to businesses… it applies to nonprofits as well. 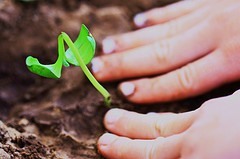 You need lead nurturing in order to introduce new prospects, such as new email newsletter subscribers, to your nonprofit. Lead nurturing allows you to educate and move those new people towards a higher level of engagement, and ultimately to making a gift to your organization. One of the best ways to nurture new leads is to implement an e-mail campaign to help these prospects learn about your non-profit. Each contact that you receive at your nonprofit is unique and different. If you talked to each of them the same way, then you’ll risk losing potential donors. ● What source did the contact come from (social media, blog, crowdfunding, etc)? ● What is the new contact’s demographic? ● What is the action you want the new contact to take (like your Facebook page, make a donation, etc)? Create a map of content that you want to share in order to educate and nurture that contact for the goal that you have in mind. At a minimum, your map should include the title of the content piece and the number of days when it will be sent out. Unless you are just getting started with your nonprofit, you should have a collection of stories and data that can be repurposed for lead nurturing. Take stock of what stories and content you have that fits in with your content map. Once you’ve taken a look at all your existing content, you can identify any gaps you need to fill and work on crafting new content. Email newsletter services are online applications that help you create, send, and track email newsletters. These services typically include easy ways for you to create and manage lists of contacts as well as customize designs of your newsletter templates. One of the powerful features that email newsletter services have are automated emails (sometimes called autoresponders). These emails are sent out after a predetermined time a contact has been added or when a contact conducts a specific action. Once you’ve taken inventory of your content, filled in the gaps, and selected an email newsletter service, you can create the series of emails that are mapped in your plan. Create emails with impactful stories and metrics about your organization and impact. Include links to your website and blog for more information. Link clicks are also trackable so you can see which new contact is highly engaged with your lead nurturing campaign. Lastly, don’t skimp on design. Include high resolution photos and imagery of your work so that the new contact can connect with them on an emotional level. After your lead nurturing campaign is activated, you can review the results of the campaign from within the email newsletter service. You’ll be able to see which content gets the most opens and clicks as well as which contacts are engaging with your campaign. This gives you the opportunity to test different subject lines against one another to see what types of subjects get higher open rates. Pay close attention to what types of links are getting clicked and what type of language is getting read. Professional or conversational? Technical or simple? Experiment with what day and time you send the mailing as well. Rob Wu is the CEO of CauseVox, a nonprofit crowdfunding platform. He has raised over $200,000 for his own social good crowdfunding projects, and his work has been recognized by the New York Times, CNN, Forbes, and Wall Street Journal. Previous post: Perfect Fundraising is Impossible. Raise Money Anyway.